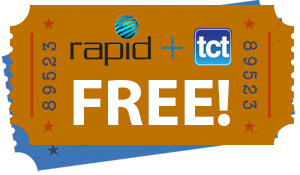 Attend RAPID+TCT Free On Us! Register for free admission to the RAPID+TCT; courtesy of Yaskawa America. New ways to get more prints from your machine, and more machines out the door. Explore the marraige of printing with machining, plus the best ways to control them both. Get faster, more prectise and consistent performance in finished prints, without changing your existing G-code. Better ideas for bridging the gap between your latest design and a reliable, productive finished product.